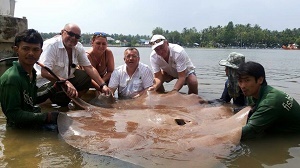 Another Thailand stingray fishing trip saw Polish angler Irek and a group of anglers fishing at the Mae Klong River in Samut Songkran. After landing big stingrays on previous trips the anglers were soon positioned in a wide section of the tidal river on a sweeping bend. With floats deployed at various intervals across the tidal river the anglers waited for developments to unfold. Also in attendance was Dr Chansue from Chulalongkorn University VRMC and her team of veterinary scientists. It did not take long before a small Giant freshwater stingray picked up one of the baits. The stingray was landed after a short battle and was estimated to weigh 35kg. A double take soon saw two of the group hooked up with stingrays and resulted in two more smallish stingrays of 30-40kg being landed shortly after. The stingrays were examined by the scientists before being photographed and released. After a lull in activity, one of the floats burst into life. The Giant freshwater stingray on this occasion was a much stronger fish, using its size to its advantage in the fast flow of the river. The Monster Thai stingray was landed almost an hour later and was measured at a width of 1.88m.